Globally, 2.7 million newborns die each year. It’s an unfortunate reality that is often more prevalent in developing regions and third world nations. To help combat the problem, Teresa Cauvel and Sona Shah launched Neopenda -- a medical device startup focused on emerging markets. Their first product is a device that monitors the vital signs of critically-ill newborns. In this post, they talk about where they came up with the idea for their company and why they’re working to improve medical outcomes in low-resource countries. Overcrowded and understaffed -- these are two terms that describe many hospitals outside of the United States, particularly in developing nations where healthcare problems are fairly common. But of all the demographics affected by these problems, infants are perhaps one of the largest. According to Sona Shah, Co-founder and CEO of Neopenda, babies in resource-constrained countries who suffer serious complications at birth have a much higher risk of infant mortality. Shah speaks from experience. Having traveled to Uganda and taught English in East Kenya, she says that she quickly found that the quality of healthcare varied heavily from nation to nation. At the time, Shah was working to earn her Masters in bioengineering at Columbia University -- it was there that she would meet Neopenda’s future CTO and Co-founder, Teresa Cauvel. After developing a business plan, they quickly moved to refine their product, a wearable monitor that can track a newborn’s vital signs. In overcrowded and understaffed hospitals, a device like Neopenda’s monitoring solution allows nurses to respond to infant distress much faster -- which can save the lives of many at-risk newborns. The devices are run on rechargeable batteries, a benefit for doctors and nurses working in environments where electricity and power is a scarce resource. Having developed their monitor, both Shah and Cauvel began to draw up plans for expansion including an oxygen delivery system, a similar vital monitor for older children, and increasing their presence in more low-resource countries. To expand their offerings and capabilities, Cauvel and Shah applied for and were accepted into one of the nation’s most prestigious accelerator programs. 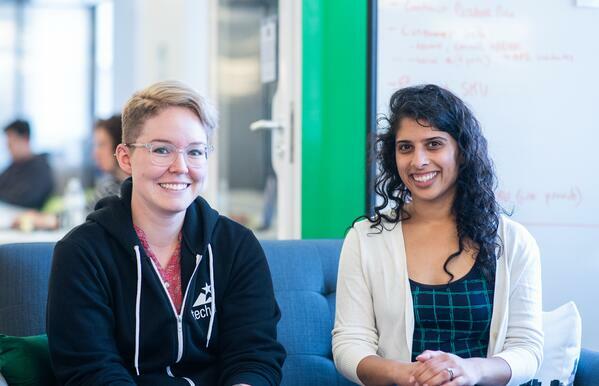 “We were accepted into Techstars and moved into the Chicago office here at 1871. It really gave us exposure to this environment with so many industry mentors, and it’s also really helped us learn more about the entrepreneurial process as well.” – Teresa Cauvel, Co-founder and CTO, Neopenda. In addition to the progress they’ve made a Techstars, Neopenda has also raised more than a hundred thousand dollars through an active crowdfunding campaign. For Shah and Cauvel, all of this momentum will help them accomplish the mission they started years ago.